The City of London’s first low-emission street could go live in less than 18 months – with plans to expand the scheme to other streets in the Square Mile. The plans – announced earlier this year and out for public consultation from today until the end of the month – would see a pilot scheme deployed for the south section of Moor Lane, near Moorgate, limiting access to ultra-low emission vehicles; classed as 75g/km or below. The consultation sets out two options for the pilot: 24/7 operation or Monday to Friday from 7am-11pm. Drivers using non-compliant vehicles in the ULEV-only zone during these times would be issued with a warning letter for the first four weeks of the trial. Following this Penalty Charge Notices would come into full effect with funds to be used as required by legislation directed towards highway or road maintenance improvements. 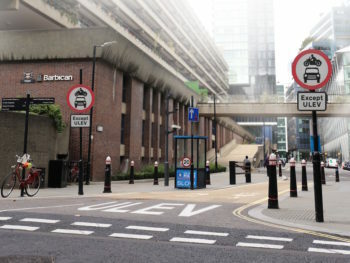 It’s envisaged that the scheme would kick in from April 2019 and be used as a pilot to consider whether similar measures are suitable for other streets in the City of London. The City Corporation would also take steps to ensure driver awareness of the pilot, including implementing clear street signage one month before the trial begins and running an information campaign including social media, leafleting and direct discussions with City firms. The plans are part of a concerted crackdown on air pollution by the City of London Corporation – which have also seen the Corporation’s Planning and Transportation Committee back proposals to turn parts of the Square Mile into zero-emission zones by 2022 and cut the speed limit to 15mph as part of its new Transport Strategy. The City of London Corporation has already banned the purchase of diesel vehicles from its own fleet of 300 vehicles, where there is a clean market alternative. It’s also implemented emissions-based parking charges for on-street parking in the Square Mile, targeting high polluting transport with higher charges while rewarding drivers of low-emission vehicles with lower tariffs. A report published by MPs on the Business, Energy and Industrial Strategy Committee outlined how incentives are vital in driving EV take-up.